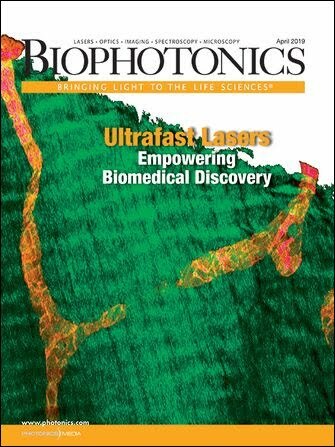 Laser tweezers could eventually replace fluorescence imaging in applications such as studying heterogeneity in virus populations and nanoparticle manipulation. A nano-optical tweezer, developed at the University of Victoria, facilitates the capture and analysis of individual proteins. It also enables single-protein interactions with small-molecule drugs and DNA. It builds on existing optical tweezer techniques, which use a single-beam laser directed through an objective lens to trap and manipulate micron-sized particles and image them in 3-D. 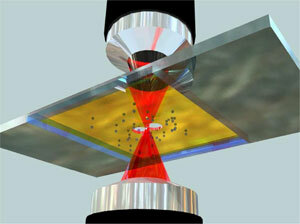 The double nanohole optical tweezer uses a standard inverted microscope and a nanofabricated metal film. Images courtesy of SPIE. Fluorescence labeling has long been used in such work, but has downsides including bleaching, low signal and disruption of biomolecules’ natural state. Fixing these requires expensive processing and instrumentation, researchers said. The new tweezer operates for an extended time and uses only the trapped object’s intrinsic light scattering. Additionally, the device offers a label-free, single-molecule, low-cost approach that operates in free solution without the need for tethers, which the researchers said can disrupt molecular motion and block potential binding sites of proteins and small molecules. The researchers have found that a double nanohole aperture makes the new nano-optical tweezer more efficient than traditional techniques, and has enabled them to achieve trapping even with low laser power. This aperture uses a conventional inverted microscope laser-trapping system. 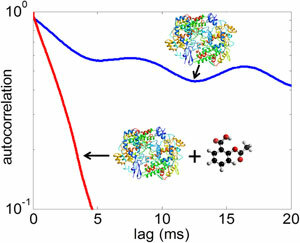 Variations in laser-scattering autocorrelation show binding-induced changes to the molecular dynamics of the protein. While some trapping techniques use surface plasmon resonance, the researchers note that this aperture does not, resulting in lower heat and energy consumption. The new tweezer also enables dielectrostriction, a pulling force capable of unfolding proteins and studying them in real time. The technique also could be adapted for DNA sequencing. The research is published in SPIE Newsroom/Nanotechnology (doi: 10.1117/2.1201405.005494). For more information, visit www.uvic.ca. A small object that behaves as a whole unit or entity in terms of it's transport and it's properties, as opposed to an individual molecule which on it's own is not considered a nanoparticle.. Nanoparticles range between 100 and 2500 nanometers in diameter.